It may not be the only PRS guitar to offer humbucking and single-coil sounds, but the 408 is the best yet. Build. Resonance. Playability. Superb single-coil/humbucker sounds. The pickup switching is not for everyone. In the decade before Paul Reed Smith formed his guitar company in 1985, he handcrafted a variety of instruments that laid the foundation for the classic PRS: the Custom. Many of those experiments featured some interesting pickup and switching designs (not least the early 80s 27-fret 'Sorcerer's Apprentice'), quite often to provide both humbucking and single-coil tones. Fast-forward to 2012, and Smith is still experimenting with the best way to achieve this duality. The 408 launched in September as the full production version of the 100-only 2011 Private Stock Signature (which was made available earlier this year as the more affordable 400-only Signature Limited). The crucial difference from any other PRS is the 408's pickup system. "They were designed to extend the guitar's tonal spectrum by narrowing the field of the bass pickup to increase its focus, and [by] widening the field of the treble pickup to increase its sound field - hence their asymmetric appearance." Not only are the cream-coloured mounting rings slightly bulbous in outline, the dual bobbins fit very closely inside the rings and are lightly arched (not stepped like the NF) to match the camber of the strings and fingerboard. The Treble (bridge) pickup is a lot larger (the dual coils measure 40mm/1.57 inches across), while the Bass (neck) pickup measures closer to 30mm (1.18 inches). In profile, those uniquely shaped pickup rings are also tapered so that they place the pickups at the same angle as the slope of the strings. "The way it's wired," says Smith, "is that when you hit the [split] switches, it disconnects one coil and adds 1,500 turns to the other coil. What happens is that there's a 'no volume loss' single-coil sound." 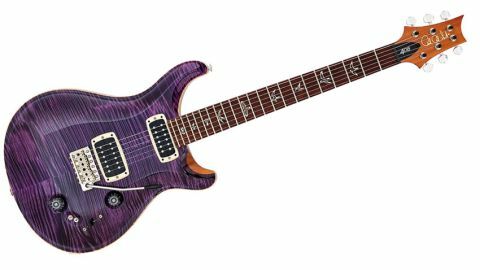 We don't really need to comment on the build quality of the modern PRS guitar, do we? It really rarely gets better, and here the guitar is superb - faultless, in fact. We seem to have a new nut material with what looks like very small metallic flecks, and the slightly larger-gauge 'Santana' fretwire (as also used on the DGT and the Studio) gives a subtly different feel than the smaller standard wire. The body depth, like most modern double-cut PRS guitars except the Custom, is the thicker (53mm/2.09 inches) 'McCarty' depth. If the pickups are, visually at least, a little unusual, so is the internal circuit, which includes an additional Sozo 'mustard' capacitor placed in the signal path. Smith is tight-lipped about its purpose, simply saying: "Do you like the way it sounds?" Using a new PRS Studio as reference, the 408 seems to have even more acoustic ring and resonance. Plugged in, however, we're met with quite a different sound. The neck pickup doesn't sound a million miles from the Studio's NF, but it's clearer in the lows: less muddy without sounding thin. "With a little volume reduction to thin the lower midrange a little, you have a very versatile rhythm sound"
The mix doesn't have that close-proximity funk of the Studio's mixes - it's more Tele-like in that regard - but with a little volume reduction to thin the lower midrange a little, you have a very versatile rhythm sound, and you can then select the neck humbucker with the bridge single coil and vice versa. The bridge pickup is another matter: it sounds huge, and even in the single-coil mode there's more humbucker-like smoothness compared to the split on the Studio's 57/08 (which sounds rather thin in comparison). Here, it's a big, balanced sound with a single-coil character and a higher mid crispness, but it's also bell-like and pure sounding. Engaging the full-coil mode, there is a very a subtle yet noticeable lift in volume, but it raises the whole sound, attenuating the single-coil-ness slightly. Really big chords and arpeggiated parts sound fantastic and lap up modulation and delays. We're seriously impressed... and we're still on the clean channel. "In the single-coil modes, there are plenty of reference points: a beefy Tele, a smoother Les Paul Junior, the cleaner ring of a good Les Paul Delux"
To be fair, it's little different as we up the gain. In the single-coil modes, there are plenty of reference points: a beefy Tele, a smoother Les Paul Junior, the cleaner ring of a good Les Paul Deluxe, and with a little tone roll-off it could be a nicely recorded Rickenbacker. The Studio now sounds a little, er, clichéd. Yes, its 57/08 is a very evocative Gibson-esque voice, certainly with the woody resonance of the guitar, but it also sounds a little peaky in the mids and trimmer in the low- end. In contrast, the 408 sounds more 'produced', the lows seem richer, the midrange smoother and the highs crisp but sweet. As ever, the volume and tones just create more subtle colours, and we soon get used to the unusual switching. That said, unlike some H/S/S guitars, if you're going from the single-coil mixes to the bridge humbucker, you need to hit two switches: the lever selector and the coil-split switch. "I think the 408 is potentially the spiritual successor to the Custom 22," suggests PRS's UK distributor, Gavin Mortimer. "Early indications of initial interest suggest it might rival the Custom 24 for the best-selling slot." Whatever sonic sorcery is at play here, the 408 not only includes all of Smith's '21 Rules Of Tone' tweaks that have been implemented over the years - the first model to do so - but it sounds fantastic. That's not just down to the new pickups, of course; there's some serious voodoo going on under the hood here. Smith has soaked up the past and produced a guitar that looks to the future. A must-try for any musician serious about their sound.